I’m going to get ridiculously sappy here, and I don’t even feel guilty about it. I was blessed with such a sweet little boy. My eight-year-old is the most tender-hearted lovable kid I know. He cares so much about those around him. His heart is sometimes bigger than he can even handle. Happy tears. Sad tears. Scared tears. He’s not afraid to show his emotions. Last Valentine’s Day, I arranged for him to take me out on a date, and it was so sweet. Opening doors for me. Paying for dinner (with the cash I gave him for the evening). Cleaning up the table for us. Perfect manners. The woman who gets to win the prize of my son (in about 20 years…) is going to be one freaking lucky lady! And speaking of lucky ladies. I don’t know what I did in past lives to deserve the love of my amazing wife in this life, but I am extremely lucky. She loves me absolutely unconditionally. Through thick and thin. Through richer and poorer. And my goodness, in sickness and in health, she has been by my side every step of the way, and I only wish I could show her how grateful I truly am. She has been so incredibly patient with me in all that we have been through together. In our marriage, I am definitely the lucky one. She supports my in my dreams, she has gotten me through so many tough times, and she does so much for our family. I may not be the best at showing my love. I’m not super mushy and affectionate all the time, although I do try because I know that is my wife’s love language. What I’m good at is showing my loved-ones how much I care with the food I make. I love making special treats for my family, especially for special occasions. With Valentine’s Day this weekend, I’m so excited to show them my gratitude. 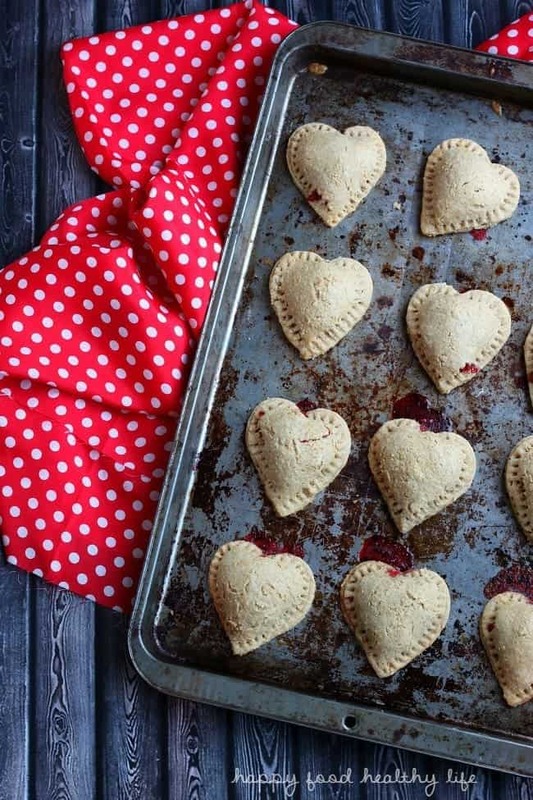 These little pies are full of more than just love though. 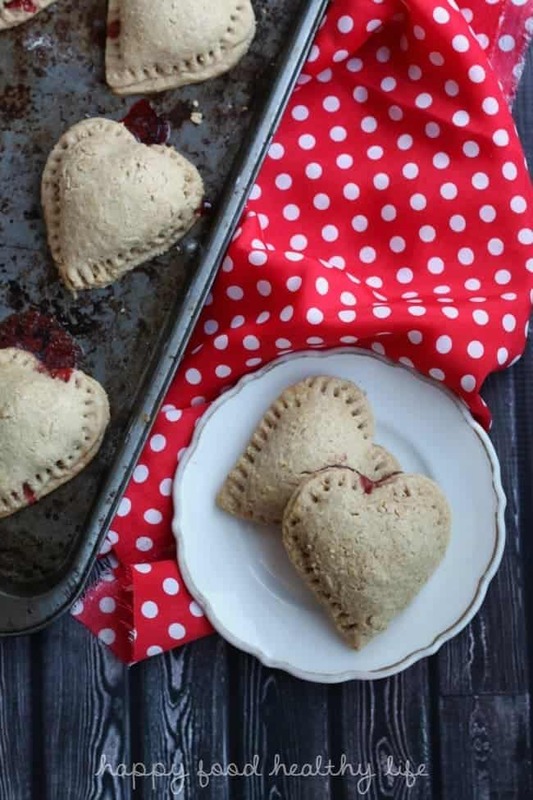 They’re full of fresh fruit and sweet melty chocolate and surrounded by a crust that is health-conscious without the healthy taste. 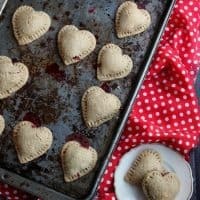 When my family bites into these, I hope they can taste more than just the ooey-gooey filling pouring into their mouth but the love and gratitude that went into each and every pie. 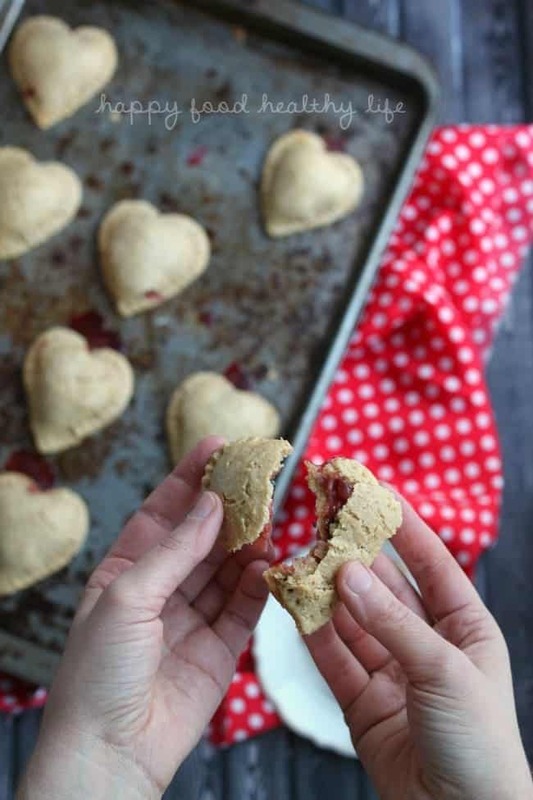 I love my little family more than they can imagine, and I am so lucky to be able to bring them healthy treats this Valentine’s Day. Combine flour, ground oats, sugar, and salt in a medium bowl. Using a cheese grater, grate the cold butter directly into the flour mixture. Using a pastry cutter, cut in the butter until you have small and flaky pieces of dough. Sprinkle with water, a tablespoon at a time. Using your hands, start to combine and shape together until just barely combined. Do not knead or work together thoroughly. You are looking for a shaggy dough. Once dough is mostly sticking together, turn it onto a floured surface and shape into a flat disc shape. Cover with plastic wrap and place in the freezer for about 15 minutes. While the dough is in the freezer, you can work on dicing the strawberries into small pieces. Place them in a bowl and sprinkle with sugar. Mix together and place in the fridge. Remove dough from freezer, unwrap, and place on a floured surface. Roll the dough out to a 1/8-inch thickness. 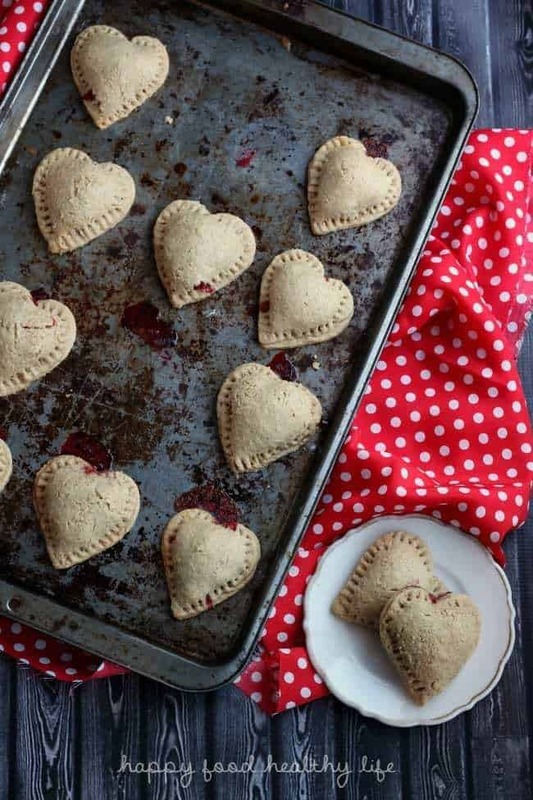 Using a heart-shaped cookie cutter (or any basic shape you'd like), cut out pieces of dough. Place half of them on a baking sheet lined with parchment paper or a silicone pad. Spoon a small amount of strawberries and a few chocolate chips in the center of the heart. Brush the edges of the heart with all small amount of the beaten egg. Top with a second heart, pressing the edges down with the back of a fork to seal it all in. Brush tops with a thin layer of remaining egg whites and sprinkle with a tiny bit of sugar. Place in the oven for 25 minutes or until the crust begins to brown. Remove from oven, let cool slightly and serve warm. I will definitely be trying this recipe. We love whole foods, especially freshly milled flour, and I’m always looking for recipes, other than bread, that help me use it up. Thanks for posting!